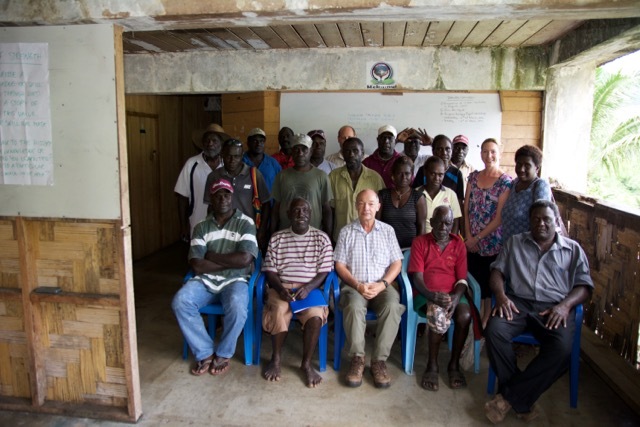 In February and March another round of community dialogues for the Panguna Dialogue Project (PDP) took place on Bougainville. The dialogues were run by members of the Bougainville team of PDP. 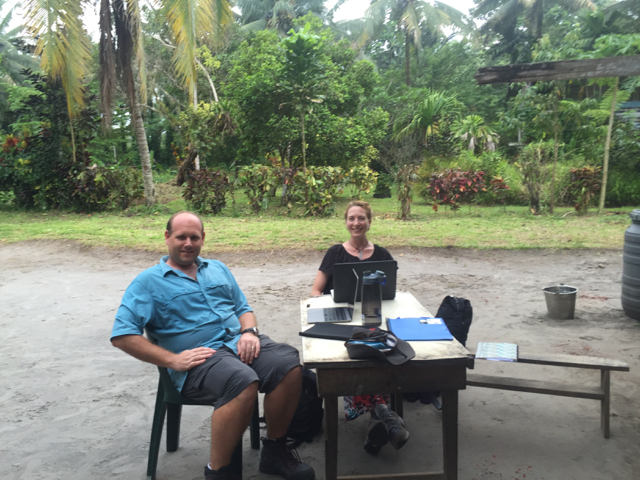 They took PDP to remote communities in the interior of Bougainville. During the three-day events community leaders discussed issues of community governance, development and dispute resolution. The dialogues were held in Pakia village in the Council of Elders (CoE) area of Ioro 2, in Lamane East ward in Bolave constituency and in Karato, an extremely remote area at the west coast of Bougainville. Dialogues were each attended by around 30 to 40 participants, including chiefs, CoE members, women leaders, church leaders, representatives of youth and of ex-combatants as well as members and leaders of the Meekamui movement. Moreover, Meekamui leaders joined the PDP team members as facilitators for the Karato Dialogue, given that Karato is a stronghold of the Meekamui movement. In the first phase of the dialogues, participants discussed issues affecting their villages in smaller groups, and then presented back to the plenary. In the next stage, the strengths of communities were discussed and a large number of strengths identified. In the Ioro 2 Dialogue, for example, stories of strengths included reconciliations, setup of elementary schools and small businesses. On the final day of the dialogues participants brainstormed project ideas and discussed action plans. The most important problem to be addressed in Ioro 2, for example, was leadership at the Village Assembly level. Participants decided to set up a new village government before July and developed a multi-staged action plan for the implementation of this decision. 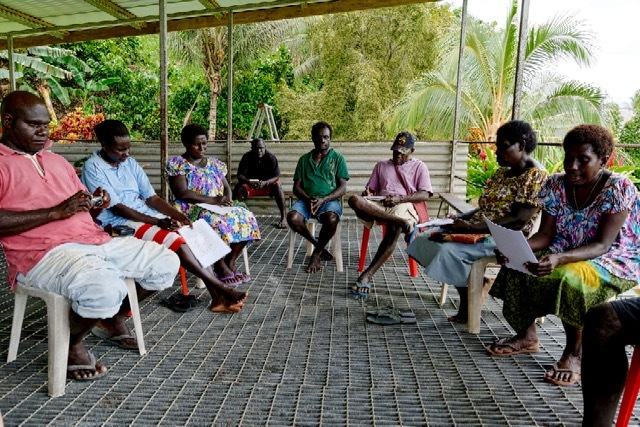 In the following months, the Bougainville PDP team members will accompany and support community members in the implementation of these action plans. In parallel to the community dialogues the PaCSIA team, with the help of local colleagues, conducted two-day storytelling sessions were in those communities in which dialogues had been held in October last year. The purpose of the storytelling was to reconnect with these communities and to take stock of the changes that had been achieved since October. They also provided an opportunity to reflect on strengths and challenges in the process and to develop new ideas for further progress. These storytelling sessions were based on the collaborative narrative practice method developed by the Dulwich Centre in South Australia. These storytelling events were held in Manetai (Eivo-Torau), Siimalaka (Bolave) and in Okoni (Ioro 1). Communities were asked to share stories of strength and stories of change. Serge Loode and Erica Rose Jeffrey from the PaCSIA PDP team collected and typed up the stories shared during these events and then the stories were read back the next day. Communities decided that they wanted their stories to travel, and stories were shared between the different communities. An additional special storytelling event was held with the Meekamui leadership in Panguna. This event was attended by several members of the Meekamui Government of Unity, including the President Phillip Miriori, the Vice-President Phillip Takaung and the Commander of the Meekamui Defence Force, General Moses Pipiro. Participants highly appreciated the opportunity to tell their stories, and it became evident that such storytelling can be a very powerful means of reflection and dialogue and can lead to the emergence of new ideas and plans for change in the future. In addition, the PaCSIA printed a booklet of stories from each community and these remain with the communities as documents to symbolise what has been achieved. Before the Community Dialogues and the storytelling events, the whole PDP team carried out a week-long facilitator dialogue, which included reflective practice learning sessions and planning for the community events. At the end of the PaCSIA visit a one-day PDP team meeting was held in order to reflect on the experiences of this round and to plan the next project stages. Furthermore, a meeting of the PDP steering group was held. Steering group members were briefed about PDP activities and got involved in the planning of future work. The ABG members in the steering group (Dennis Lokonai, Clarence Dency and Michael Lapolela) as well as Commander Moses Pipiro, who represents the Meekamui movement in the Steering Group, expressed their appreciation of PDP’s work and committed themselves to further assist PDP as well as follow-up activities after PDP will have come to an end. With regard to PDP follow-up it is exciting to note that the NGO which had been formed by the Bougainville PDP members in October last year has taken important steps forward. 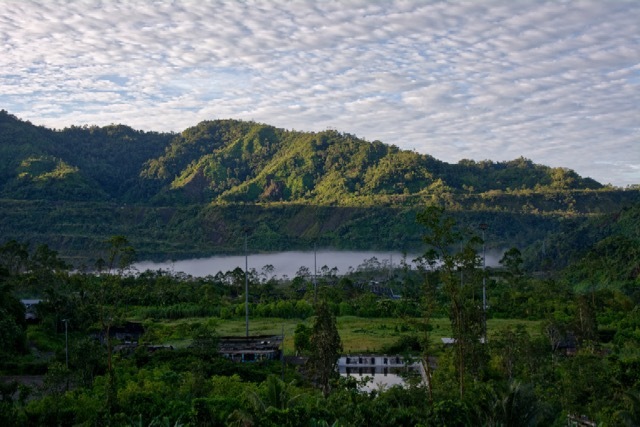 This NGO – ‘Bougainville Indigenous Dialogue’ (BID) – has been officially registered. It has elaborated a mission statement and has set up its own website, and a preliminary board of directors has been selected. Planning for BID work as continuation of PDP is well under way, and so are applications for project funding. Furthermore, on 10 March a joint meeting of BID, PaCSIA, a representative of the Pacific Centre for Peacebuilding (Suva, Fiji), and the Nasioi Peacebuilding Association (another local Bougainville NGO) discussed options for future collaboration. These are important positive steps which augur well for the continuation and sustainability of the work PDP has carried out over the last months. The new round of dialogues in March was a great success, similar to the first round in October 2015. The seeds of dialogue are bearing fruit in the Panguna communities.